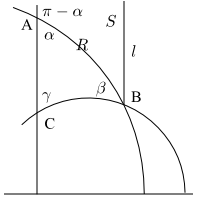 We can see from this that the hyperbolic area of a region bounded by two vertical geodesics and a single non-vertical geodesic (on the side extending to positive infinity) depends only on the so-called defect, the difference in interior angles from . 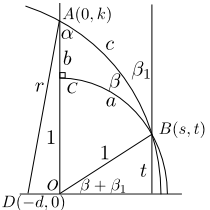 This region can be thought of as a triangle with one vertex at infinity. 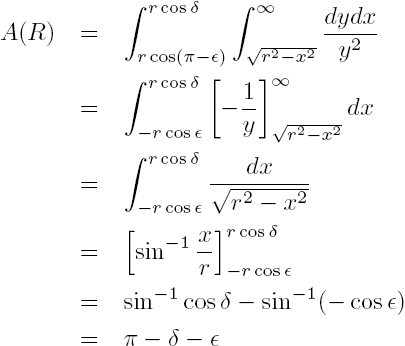 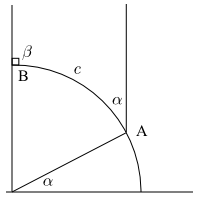 This is what is known as an ideal vertex. 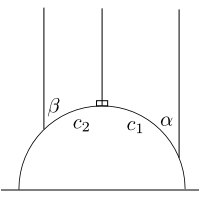 We can see that if vertical geodesics were drawn from the points of intersection of a semicircular geodesic with the -axis, the area of this ideal triangle (having three ideal vertices) would be exactly , though each of its interior angles would be zero. 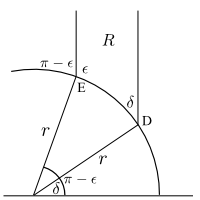 In the figure to the right, we have drawn a triangle bounded by three geodesics (as any triangle must be). 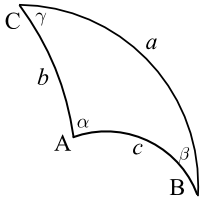 To find the area of this triangle, we just subtract the area of from the area of (the whole region above the lower semicircle), which we can do by using the method and formula derived above to give us again that the area is exactly the defect in interior angular measure (we leave it as an exercise to show that this is true for any triangle, even if not bounded by a vertical geodesic). 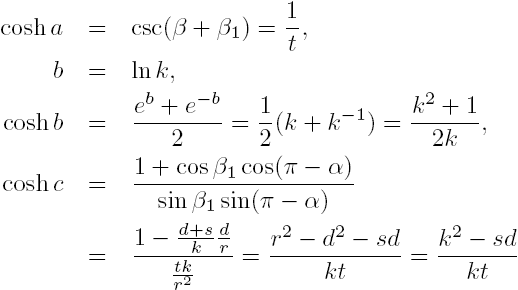 which is the Pythagorean Theorem (as we would expect: since is a manifold, it must be locally Euclidean).